Fast Food is a new, regular blog by Thomas Schoenberger and Max Dax. Every Saturday you can read a new part of their ongoing conversation about cooking, traditions and how to read the menu of any given restaurant. Of yeah, and why so many chefs listen to “electric period” Miles Davis’ after an exhausting night in the kitchen. 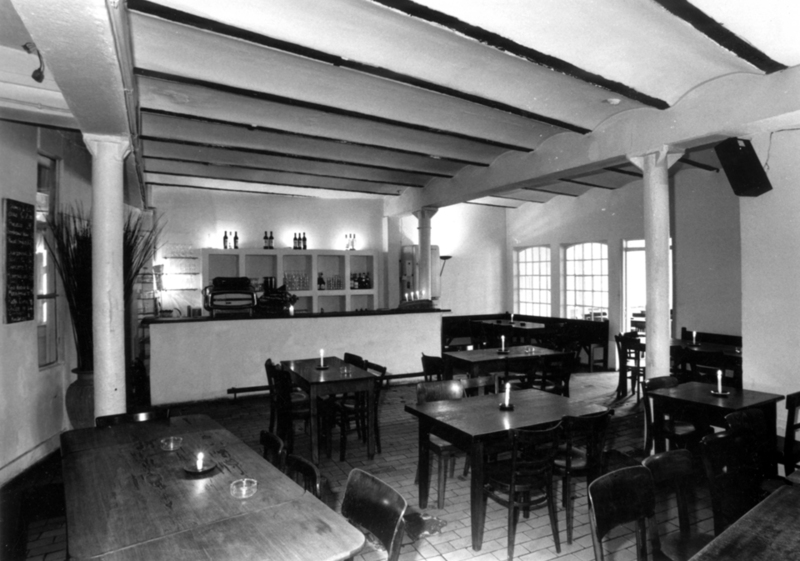 The photo by Arnd Hoffmann shows an interior view of the Restaurant Schönberger in 1994. Dax: If you take into account that we have to eat and therefore cook on a daily basis, the lack of documentation is absurd. I have both vivid and at the same time blurry memories of the Schönberger. Of course, there’s no book about it—you will hardly find any books on restaurants or bars that you might assume worth a volume or two. Of course, sometimes you can find books that examine certain phenomena when it comes to restaurants; books about the Venetian bacari, the Viennese Heuriger wine taverns or the Paris bistros do exist. But only in rare cases would you consider these proper records of traditions. Speaking for myself, if somebody would ask me to tell the story of my life, many chapters would be staged in restaurants, trattorias, bistros, ouzerias, osterias or brasseries. You’d probably find more places that are linked to something that you might call the gastronomic street culture, something that gets lost as soon as, say, an osteria closes forever. Supposedly semi-legal places like Palermo’s Zia Pina, where they grill the fish in the osteria’s entrance corridor and not in the non-existing kitchen, will be forgotten one day unless, well, unless you document the memory. Zia Pina hasn’t been written about beyond the casual newspaper article, even though spaces like that live in our memories until we die. Ideally, they’d become the backdrop of a novel or even a film, which means they then enter the realm of fiction. Just like the history of the blues or American folk music, the story of the simple taverns and tables has traditionally been told as an oral history. Thomas, I have the impression that an integral part of our dialogue will be just like that—jumping from one memory to the next, as memories are all we have. Especially if we talk about the techniques and procedures of cooking itself, I have this premonition that, more often than not, we’ll be discussing specific memories linked to a specific time and space. That’s why I want to get back to the white industrial loft space that was your restaurant: How the hell did you actually get hold of this space? Schoenberger: Back then, before I opened the restaurant, I was a partner in a company called Vertrieb trockener Weine—Distributor for Dry Wines. My associate and I regularly shuttled between Venice, Tuscany, Frankfurt and Hamburg. In Venice and Tuscany, we were buying large quantities of Italian wine for little money, and were praying that we’d get it to West German wholesalers before the wine would lose its quality. Dax: You mean the temperature and altitude changes that occur when travelling through the Alps? That’s what can ruin a local wine from Italy and make speculating with wine a game of chance, correct? Schoenberger: I prefer to give you the short answer because I think we should talk a whole evening about wine, but not tonight. Here’s a brief explanation of the procedure of wine speculation: Every autumn I’d travel to the north of Italy to visit vineyards and buy large quantities of not yet fermented wine, where the owner would mark whole barrels with white chalk, signifying that they’ve been sold. As soon as the wine has completed the fermentation process in spring, I’d return to the vineyard and attend the filling procedure from barrel to bottle in the cellar. Should the wine have suffered a loss of quality during the winter or, God forbid, gone bad, it’s not the problem of the estate but that of the speculator. The chalk mark on the barrel is the archaic proof of an archaic and binding deal. Read the third episode of Fast Food here.